The world sits on the cusp of paradigm-shifting changes. We may not know the exact timing of events, but we know the trend, and it’s not looking good for peace and stability. In fact, uncertainty and panic appear to be the new normal. And with that kind of instability our country is primed for trouble. If you are concerned about what may happen – violence in our cities, more restrictive regulations, and financial chaos – then you’ve hopefully already explored your strategic relocation options. Do you have a place to go if it hits the fan? And if so, are you prepared for the collapse of the system as we have come to know it? Whatever your answer, I wanted to share the latest FREE guide from our friend and well known survival expert Todd Savage of SurvivalProperty.com. If you have questions about finding a homestead, emergency “bug out” property, or how to prepare and position your existing home and property for emergency situations, I strongly encourage you to visit his web site. 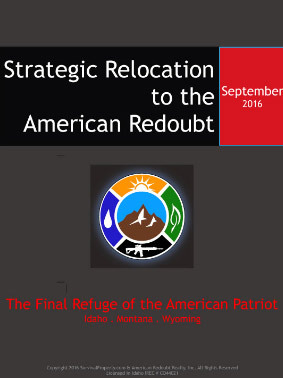 First, check out his FREE Strategic Relocation To The American Redoubt Newsletter. Then, check out the scores of properties at his website that may get you to exactly where you need to be if the worst happens. For ANY questions you may have about relocating, or if you’re looking for assistance with property security, family preparedness or anything in between, we encourage you to contact Todd Savage at Survival Retreat Consulting today.